A must have for any teacher of the William and Mary Language Arts Curriculum for Gifted and High Ability Readers! 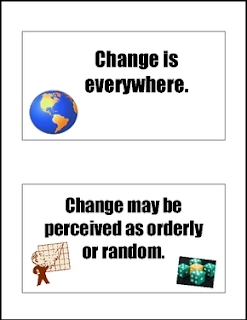 I have typed the five core generalizations about change and included small graphics. You can post these on a bulletin board or copy on cardstock, laminate, and affix magnets to the back. Posting these cards allows students to constantly refer to each generalization about change throughout the unit.